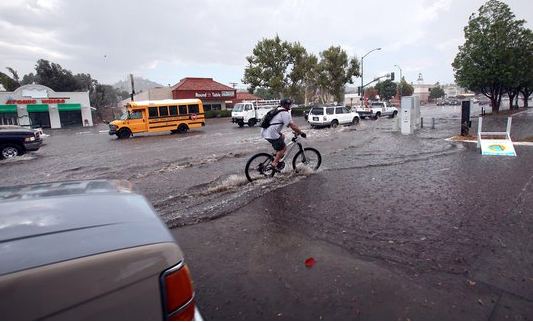 A rare September cloudburst in San Diego. Photo by John Gastaldo. There’s a famous, quotable line in the movie Lawrence of Arabia that is spoken by Prince Feisal after hearing that T.E. Lawrence loves the desert. I love rain. I love the way it makes the pavement shine at night with the reflections of street lights and car lights. I love downpours and the way the water rushes downhill in the gutters. Two days ago a storm cell wandered across San Diego County and I got caught in the middle of it when I went to pick up my daughter at her grandparents’ home. By the time I got to their condo complex it was starting to pour. Sophie was trembling with excitement. We ran up to the highest landing of the building’s outdoor staircase. There we could see the grey scrim made from billions of raindrops, shifting with the wind against the backdrop of trees and buildings. After we got in the car and started the drive home we found the traffic was stopped on the tangle of 4-laners and freeway entrances in the valley below my parents’ hilltop development. The heavy winds threw the rain diagonally and I felt the car shudder from it. Lightning flashed in the distance and we heard the thunder in its wake. I later learned that trees fell across roads and onto cars. Maybe this was the remnants of the hurricane that traveled up the Gulf of Cortez and still had a little punch left when it reached the American border. I don’t know. But what hit us was an isolated storm. As I traveled east, to eventually reach my house, the rain tapered and the streets of my neighborhood were nearly dry. California has been in a drought for two-plus years. I grew up in a place where rain was plentiful. Since I moved west my view of it has changed. Rain is always good news. Please rain on my parade! I’ve become like the Arabs in Lawrence. I love water and green trees. My heart longs for the next time water, the blood of creation, falls from the sky. This entry was posted on September 20, 2014 at 6:25 pm and is filed under Uncategorized. You can subscribe via RSS 2.0 feed to this post's comments. You can comment below, or link to this permanent URL from your own site.